Finding anything Draft size is frustrating, that is why at DraftTack we are importing our own in both large and small draft sizes. It is great to be able to use a bridle that will correctly fit your Draft or Draft Cross!! E-mail us with ideas of what you are looking for and if enough people want that item, we will have it made. Super Classy Dressage Bridle with White or Black Padding. Simple yet elegant. Includes plain leather reins. 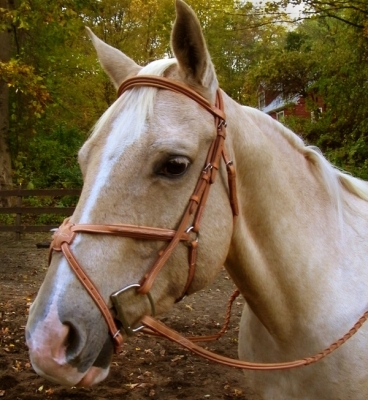 Chestnut color leather English bridle with stitching on the browband and the noseband. It comes without a flash. Bit to Bit - 44" to 54"
Throatlatch - 44" to 50"
Noseband - 27" to 32"
Also a DraftTack exclusive. V Browband Havana English bridle. Super classy!! Comes with reins. Available in Small Draft sizes. Also extra browband available, in size 18". See bridle parts section for browband. Brown Fancy Stitched English Bridle with Silver Padding. Super nice soft supple leather. Comes with Flash and plain reins. Double Havana bridle suitable for Dressage or Hunt. Comes with two Bit to Bit and 2 sets of reins. Leather Double Bridle. Padded with Two sets of Plain reins. 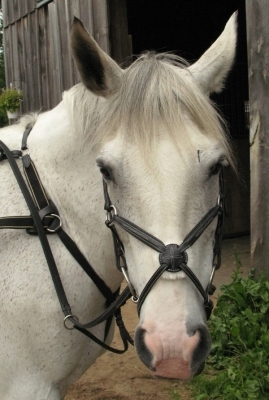 This finely crafted Amish built basic English Bridle will give you years of use. 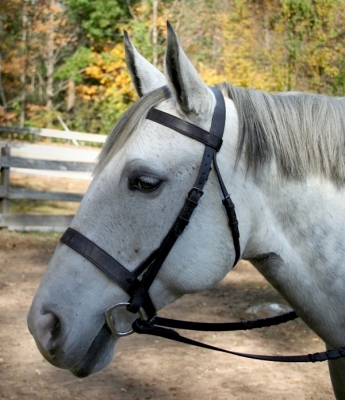 This Bridle has plenty of room to put more holes and adjust down to make smaller. 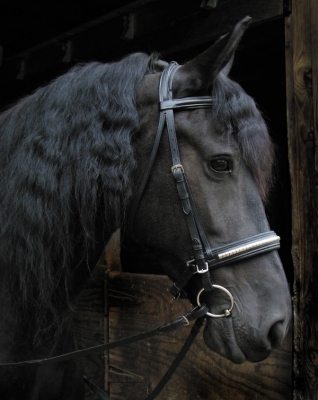 The ability to adjust makes this a great bridle for that growing Draft that will only get bigger, or just a beautiful everyday bridle for your older guys too! Buckle end Bit to Bit 47" to 57"
This stylish clincher nose bridle looks great on horses with heavy forelocks that hide the browband. Softly padded crown, brow and nose. 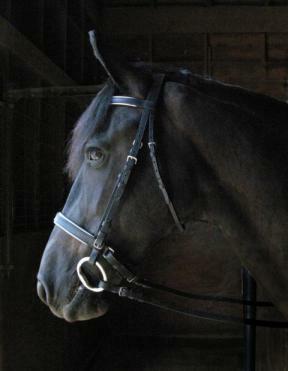 Crank style noseband. Gripper reins with stops. Made from Continental leather from one of the world’s major tanners. The leather is tanned and curried with plenty of “fat liquoring” for suppleness and long life. Slotted cavessons and lined turnbacks on reins and cheeks for durability. Aniline finished leather for easy cleaning and preservation. Oil soaks in and doesn’t bead up on the surface. 10 stitches per inch for beauty and strength. Stainless steel buckles and hardware will never rust. Back punched holes make buckles easy to use. The Concho Dressage Bridle is a stylish dressage bridle with a padded nose, brow, and crown. The Black leather bridle with silver piping on nose and brow has a small silver 3/4"x 3/8" horse ornament at center of the browband. It has a crank style nose. Comes with laced reins. These bridles are made from continental leather from one of the world’s major tanners. The leather is tanned and curried with plenty of “fat liquoring” for suppleness and long life. A great value – sturdy enough for everyday use, pretty enough for showing and modestly priced. Imported. This EliteTM Black Patent Leather Dressage Bridle is a special, dressy all black Bridle made out of shiny patent leather. It has a broadly padded nose, crown and brow for added comfort and a convertible flash that can be easily removed without damaging the bridle. It has a crank noseband and comes with rubber lined reins for secure grip. Sizes: Draft, Large Horse/Small Draft, Horse Bits sold separate on the "Draft and Warmblood Bits" page - go to the "DraftTack Home Page" to find the Bits section. •Full grain cowhide for durability. Specially tanned for just the right balance of firmness and flexibility. Soft and pliable -- gently secure between your fingers from the first day you use it. •Elite leather is aniline finished for easy cleaning and preservation. Oils soak in. Never bead up on the surface. •Stainless steel buckles and hardware will never rust. •Back punched buckle holes are easy to fasten. An EliteTM bridle with a surgical finish stainless steel SW bit is one of the kindest things you can do for yourself and your horse. .
Used by upper level dressage riders, this bridle is complete with bradoon hanger and two sets of reins--a flat rein for the Weymouth and a larger rubber lined rein for the bradoon. Softly padded crown is soft against the poll and ears. Padded brow and nose are comfortable against the horse's face. Black. 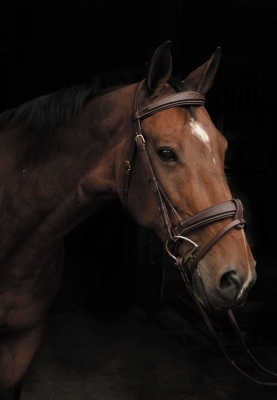 EliteTM bridles are made from the finest European leathers and stainless steel hardware. This leather is specifically tanned for just the right balance of firmness and flexibility. Soft and pliable. Gently secure between your fingers from the first day. The finest leather we have found. It has padded crowns, nosebands and browbands and comes with buckle guards to assure comfort for your horse. EliteTM bridles are edged, fitted and sewn by skilled bridle makers with careful attention to every detail for a perfect show quality: Slotted cavessons and lined turnbacks on reins and cheeks for durability. Aniline finshed select cowhides for easy cleaning and preservation. Oils soak in – don’t bead up on the surface. 10 stitches per inch for beauty and strength. Stainless steel buckles and hardware will never rust. Back punched holes are easy to buckle up. Smith Worthington"s McBrideTM Figure 8 Bridles are made of the finest English and European leathers. McBride bridles have leather that is aniline finished - never pigment (painted) finished. (Paint can cover flaws in leather and seals the surface, stopping proper penetration when you oil your tack.) Smith Worthington uses only first quality, full grain cowhide, tanned and curried to look good, accept oil and darken and mellow as you use and clean your tack. It comes with Stainless steel buckles and hardware - polished, strong and rustproof. McBride bridles are beautifully finished - carefully hand stitched, creased, edged and hand rubbed as English bridlemakers have done for centuries. G. McBride & Son offers this exceptional quality at a very frugal price. Imported. Bridles are sold without bits.